﻿Vegetarian was the theme of this Taste of Home Cooking Recipe Swap. I submitted my recipe for Quinoa with Roasted Garlic, Tomatoes, and Spinach and was given a recipe for Lightened-up Eggplant Parm. The recipe was created by Ali, a fellow member of a cooking board I frequent. She doesn't have a blog, but I think she should start one - this was a great recipe! I made eggplant parm once before and it was good. But what I really liked about Ali's recipe was the layering of the thinly sliced eggplant, cheese, and sauce, making it more like what I'm used to getting at restaurants. Plus, the recipe was a lightened-up version (baked eggplant instead of frying, which is what I prefer), so I was really looking forward to eating this dish. Below is Ali's recipe in her words with my notes in italics. Pre-heat oven to 350. Coat 9x13 baking dish with cooking spray. Set aside. Place eggplant in a colander in the sink, sprinkle with salt and mix to coat. Let rest 20 minutes. Combine breadcrumbs, 1 tbsp of Parmesan, Italian seasoning and garlic powder (I also added a touch of salt and pepper) in a shallow dish. Place egg whites in another shallow dish. Rinse eggplant well and pat dry. Dip eggplant into egg then into breadcrumbs. Place on a non-stick baking sheet and bake in oven for 20-25 minutes or until lightly browned, turning once. 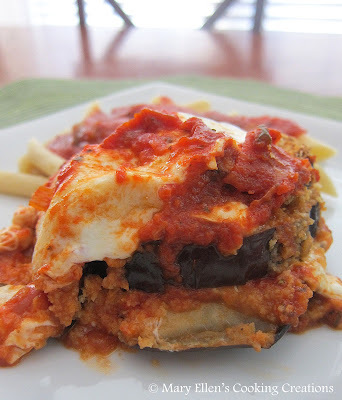 Spread a thin layer of marinara sauce onto the bottom of the baking dish, then 1 layer of eggplant, scatter 1 layer of mozzarella, sprinkle with Parmesan. Spoon another layer of marinara sauce over the cheese and continue making layers until all of the ingredients are used-finishing up with a final thin layer of sauce and cheese. There should be about 4 layers. Bake at 350 for about 15 minutes until cheese is melted and cooked thoroughly. 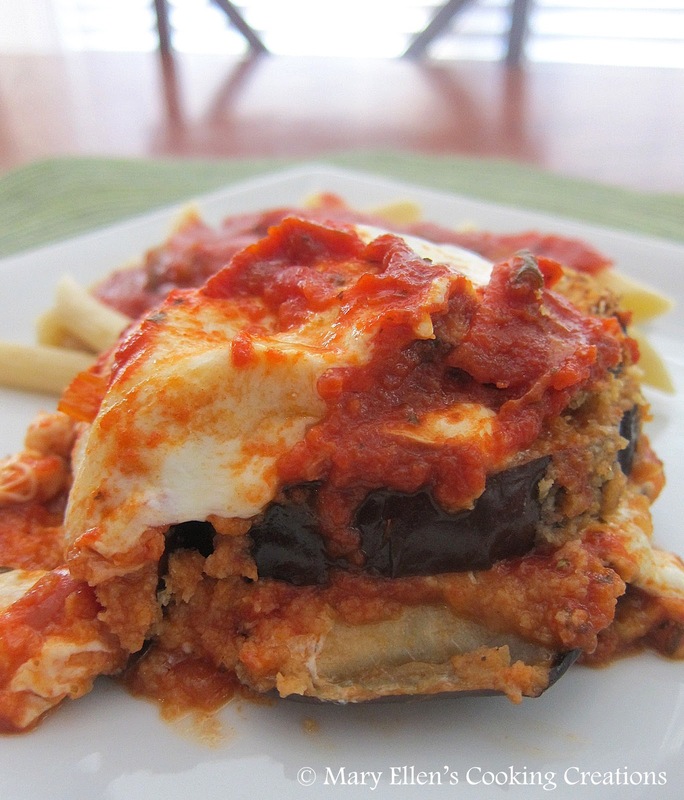 The one major change I will make the next time I cook this dish is to remove the skin from the eggplant. The skin stayed a bit tough after cooking, and everything else was just so tender and melted in my mouth that I think not having the skin to chew through would make this the perfect dish. I love eggplant. I've never seen an eggplant recipe that didn't call for frying. This will get made very soon! I am the Ali of the recipe above and I'm glad you loved it. Took me a long time to get it right. It's one of my personal faves :) Hope everyone loves it as much as I do. Enjoy!! Yum! I love eggplant parm. I need to try this healthier version for sure.